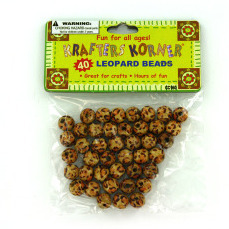 Leopard beads are perfect for personalized jewelry, embellishments and fashion accessories. The orange and black leopard print provide a trendy look. Each package comes with 40 pre-drilled beads. Comes packaged in a poly bag with header card. Not recommended for children under 3.